I painted another egg for the Open Fields egg auction! I had to squeeze in the time to do it and I'm sending it in late, but hopefully it will still be in time for their auction. 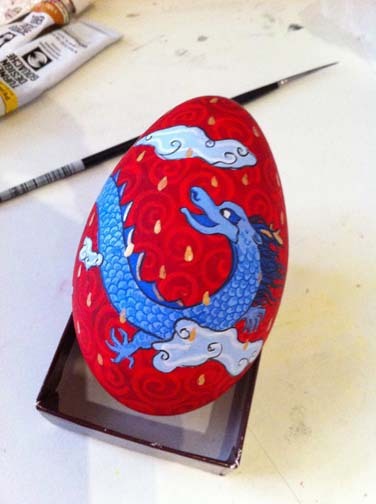 I had to, of course, paint a Rain Dragon on a red egg (red eggs are special for babies)! This year, I didn't break the 2nd egg they sent me, so I am selfishly keeping it for myself so that I can paint another red egg especially for Baby Rain Dragon when she arrives.